SPECIAL NOTICE – Thurs Jan 30: As there could be up to 20 cm of snow on Saturday, we might have to postpone Yoga-Thon. By 10:30 am on Saturday, we will post on FaceBook whether we are going ahead or postponing. On Saturday, before coming to Yoga-Thon, please check our Facebook link https://www.facebook.com/#!/pages/Applegrove-Community-Complex/99742456574. Feb. 1 Feast in the East, Gerrard Art Space, 1390 Gerrard East at Woodfield. Feb. 12: Trivia Night at Lazy Daisy’s Cafe, 1515 Gerrard St. E., 8 p.m. (ongoing second Wednesday of every month). Theme: An Affair of the Heart. Host: Dawn Chapman. Prizes, fame and glory. Licensed. Feb. 25-March 25: Craving Change at East End Community Health Centre, 1619 Queen Street East, Tuesdays 2:15-4:15 pm. Want to change your relationship with food? Come learn about what can trigger your food cravings, and strategies to change problematic eating behaviours. This program is free to people on limited income, living in the East End CHC catchment. See www.eastendchc.on.ca for Centre information. For program info or to register, call Miriam at 416-778-5805 ext. 210. Space is limited – call to see if there is still space. This entry was posted in Applegrove Community Complex, Ashbridge's neighbourhood businesses, Ashdale Village / Little India, Gerrard Street East, Duke of Connaught Public School, Event on January 31, 2014 by The Ashbridge's neighbourhood. Marcus Gee writes in the Globe and Mail on “Taking on Toronto, one ice rink at a time” – his story of skating “across” Toronto on 10 skating rinks, from west to east. He ends at our new rink at Greenwood Park. “My favourite skate was the last of my trip. 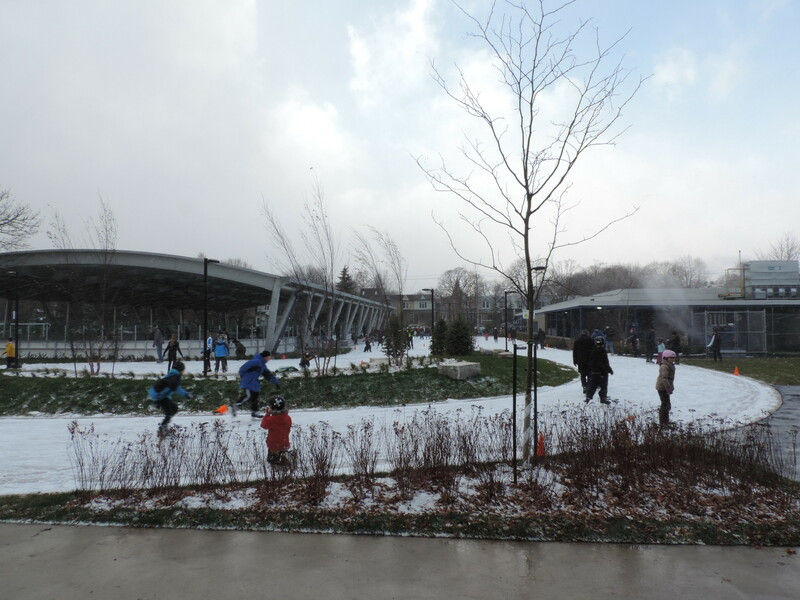 Greenwood Park just went through a big refit that put a roof over the outdoor hockey rink, a first for Toronto. The idea is to protect the ice from snow and sun, allowing for less maintenance and a longer season but still providing the outdoor experience. Alongside it is a long trail like the one at Colonel Sam Smith. As I looped around it, other skaters joined me. One was practising crossovers and going backwards. Another, a hockey player, was warming up at speed. Two little kids shuffled along, wiping out from time to time in their snowsuits, but getting right back up and moving on as their mothers watched. Taking on Toronto, one ice rink at a time by Marcus Gee in the Globe and Mail. This entry was posted in Greenwood Park and tagged Greenwood Park on January 23, 2014 by The Ashbridge's neighbourhood. 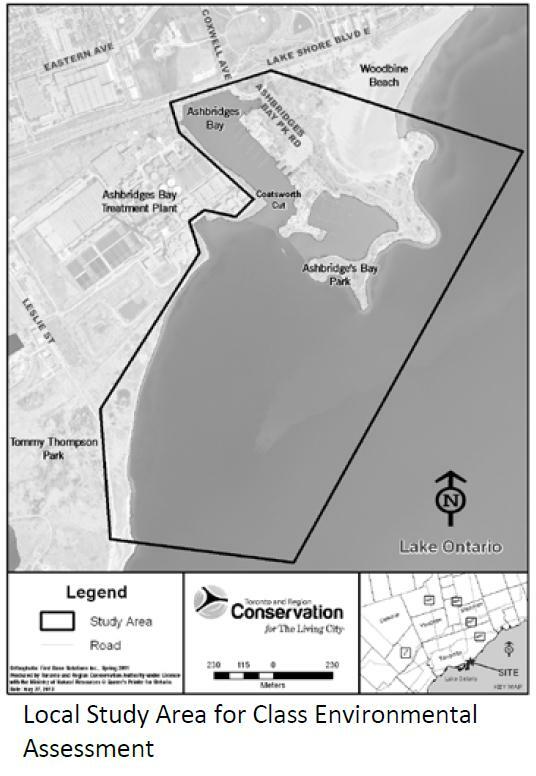 Toronto and Region Conservation Authority (TRCA), in partnership with the City of Toronto, is conducting a Conservation Ontario Class Environmental Assessment study to address erosion and sediment control issues at Ashbridge’s Bay. The study is being undertaken to identify solutions to address the existing navigation risk caused by sediment deposition at the harbour entrances of Coatsworth Cut and Ashbridge’s Bay Park, while considering approved projects and waterfront planning initiatives in the area. Please join us at our second Public Information Centre to learn about the study, the evaluation of the alternatives, the preferred alternative, and the next steps in the study process. The Public Information Centre will be a drop-in open house that will provide an opportunity for you to view display boards, discuss the project with the TRCA, City of Toronto and consultant staff, and provide input into the planning process. This entry was posted in Ashbridge's Bay, Event and tagged Ashbridge, Region Conservation Authority Toronto and Region Conservation Authority, TRCA on January 17, 2014 by The Ashbridge's neighbourhood. Try the new skating path and rink at Greenwood Park. New Brickyard Grounds café/restaurant nearby at Greenwood and Gerrard. See photo from blogto.com below. 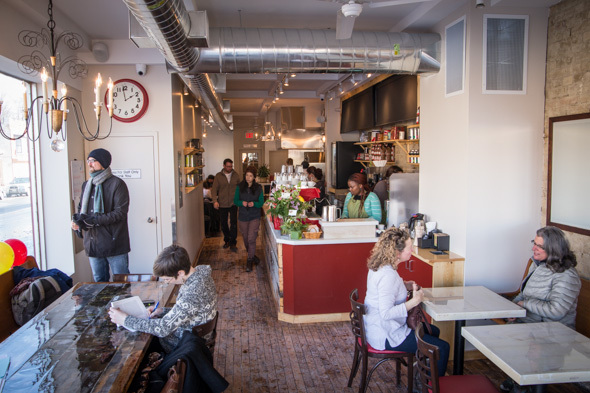 Photos by Jesse Milns on blogto. Beat the February Blues with Applegrove’s Yoga-Thon on February 1! Led by professional yoga instructors and accompanied by live music, this feel-good fundraiser is beneficial to Applegrove AND you! This entry was posted in Applegrove Community Complex, Ashbridge's neighbourhood businesses, Gerrard-Ashdale Library, Greenwood Avenue, Greenwood Park, Greenwood Village, S.H. Armstrong Community Recreation Centre on January 9, 2014 by The Ashbridge's neighbourhood.